Just get off my back! I was one of the 1.3 million people who pre-ordered a copy of "Harry Potter and the Order of the Pheonix" from Amazon.com, which meant that while I was painting my apartment on Saturday a smiling Fed-Ex man came to deliver my copy the very first day it was on sale. I have been reading it off and on since. I am on page 214, and so far, I am enjoying it -- there is suspense, there is intrigue, there is some good writing. All of the things that made the series so great and so addictive. But there is something missing, and that something is Harry Potter. 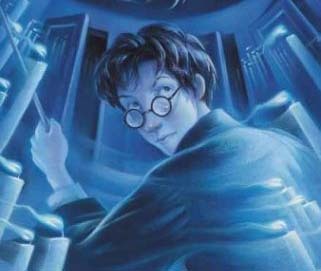 Here's the thing: as many reviews have pointed out, Harry is 15 and undergoing all the normal throes of adolesecence: raging hormones, sense of powerless in the face of adult authority, uncertainty about his friendships and the loyalties of those around him, gossip, the feeling of being caught between childhood and adulthood, etc. This means that Harry, like real adolescents, is cranky and petulent and mouthy: his mood for the entire 214 pages that I have read has been that of supreme irritation with all things. He yells at his friends, secretly resents all the adults around him, and spends a lot of time brooding by himself. I will not be at all surprised if at some point Harry turns to Dumbledore and yells, "Hey, I didn't ASK to be born!" This is all to J.K Rowling's credit as a skilled depictor of the human condition, but it is not all that fun to read. Teenagers are not that fun to be around: ask anyone who has ever attended high school. I miss bright-eyed, incredulous, naive Harry who was so enchanted with the world of Hogwarts and his new friends! I feel betrayed -- where is the Harry Potter I have come to adore? Perhaps this is what parents mean when they talk about how shocked and appalled they are seeing their cherubic smiling angel children morph into nasty brooding teenagers. When I was a teenager and I heard this, I would roll my eyes in a gesture of supreme scorn and say, "Riiiiiiiiiiiiiiiiight, Mum." (Frankly, I continue to use this technique even now when I am safely into my twenties). Now I feel like looking sadly at Harry and asking, "What happened to my little boy who was so wide-eyed over his new Nimbus 2000?" And I know that he would look at me and roll his eyes. Or seethe, which is worse. The book review on Amazon doesn't really inspire me with confidence, either. As review Emilie Coulter writes, "Gone is the wide-eyed innocent, the whiz kid of Sorcerer's Stone. Here we have an adolescent who's sometimes sullen, often confused (especially about girls), and always self-questioning." Check, check, and check so far. My sister, who also got the book on Saturday, is on page 453 and she reports that by the book's midpoint no secrets have been revealed, nobody has died, but Harry has continued to skulk around feeling put-upon. She was plannig to skip ahead 200 pages or so to see if anything but some brooding had happened, but I don't think she has much to hope for. The Amazon review ends, "Harry ends his year at Hogwarts exhausted and pensive. Readers, on the other hand, will be energized as they enter yet again the long waiting period for the next title in the marvelous, magical series." How discouraging. He even ENDS the book pensive? This does not bode well for Harry Potter VI, which will have to be titled something like "Harry Potter and the Fight for a Later Curfew" or "Harry Potter, "Why Can't I Get My Tongue Pierced? All of the Other Guys on the Quiddich Team are Doing It!"" It's a testament to Rowlings skill as an author: She has created, though her words, the virtual experience of adolesence. Reading this book has been like going through puberty: Sometimes magical, sometimes horribly dreary. Gar. Nothing to do but keep plodding through it, I suppose -- again, just like being 15: you have to keep on going, in the hope that things will eventually look up.